Fully DDA complaint with our Disabled Access Door Systems - Get in touch! DDA compliant low energy doors can often be retrospectively installed to existing doors making this a cost-effective option. 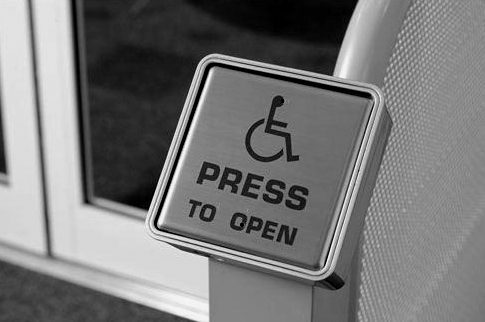 All our automatic door solutions are fitted with relevant signage and considerations include wheelchair access, door widths, clear vision panels, door entry equipment position and height; all with relevant DDA approved door handles and ironmongery. Safety sensors ensure automatic doors cannot open or close if obstructed and all automatic door operators can be fitted with a fail-safe system that automatically opens or closes the door in the event of a power failure; which can also be linked to fire alarm systems. They can also be fitted with a break-out facility to enable them to be pushed out manually to facilitate an emergency escape. What are Disabled Access Door Systems? The Disability Discrimination Act (DDA) was introduced to ensure that anyone with a disability can gain easy access to any public premises. DDA doors are an automatic door set-up which can be a sliding door or a swinging door. Any door can be converted into a DDA compliant system by adding access points such as a push pad entry. Who has to have DDA compliant entrances? More information on this topic can be found on the citizens advise website. The best solution is always one that allows independent entry for a disabled customer without requiring additional assistance. Any automatic door is usually DDA compliant. However, things can get a bit more complicated with Manual Doors. EAS can offer a service where we keep the manual door system in place but also have an automatic motor attached, which is activated when needed. This for example means, that the door is manually operated for most of the time, however, when someone does require assistance they can activate the automation and the door will become more easily accessible. This could take the form of a push pad, a swipe key or a call button. There are many options that we can offer to ensure we meet your particular needs. DDA compliant Push Pads can be installed retrospectively in most cases. EAS can fit these devices on most standard doors even if they are not usually automatic. Installation can be very simple and may only require us to change a few parts on your existing door system. EAS complies with line with the latest UK and EU safety regulations. We can also fit doors with safety sensors to ensure that when the doors open they do not cause harm to anyone. Even security features like this can normally be retrofitted to a door system within a working day.